A California public utility company suspected of starting deadly wildfires in the Golden State is holding out hope that officials might rescue it from liabilities threatening its financial stability. California’s energy regulator is pledging a review of Pacific Gas & Electric Co., as well as possibly breaking up the state’s largest utility. The regulator is also open to allowing PG&E to pass costs associated with liabilities from wildfires to customers. “In general, we try to make sure that all utilities have the economic strength and wherewithal to procure the goods and services that Californians need,” Michael Picker, president of the California Public Utilities Commission, told The Wall Street Journal Thursday. PG&E disclosed shortly after the fire began that one of the company’s high voltage power lines malfunctioned 15 minutes before the start of the Camp Fire was reported in the area on Nov. 8. It could take several months for investigators to determine what caused the fires. The utility, meanwhile, has withdrawn all of the available cash from its revolving credit lines, according to a Securities and Exchange Commission filing Tuesday. Companies often take such actions before a bankruptcy filing. 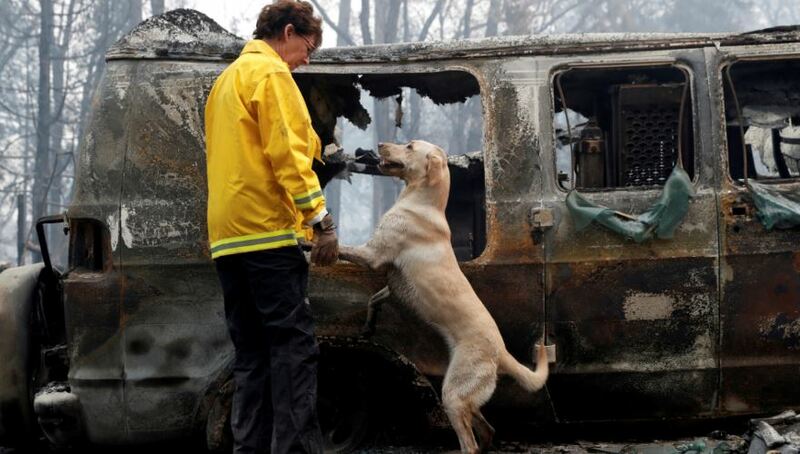 The move comes as wildfires continue scorching large sections of Northern California. State officials are investigating the cause of the Woolsey and Hill Fires in Southern California, both of which have destroyed hundreds of buildings and forced the evacuation of thousands. The Camp Fire in Northern California, meanwhile, has become the deadliest in the state’s history.